So we start our tour with a dream and a idea, "To speak wisdom and preach our word of why we love to kite! And why we love to Kite Ozone." With our tour getting ready to take off the ground and fly down the east coast, we have preparations before we can leave for our journey of epic proportions. As our winter is coming to a end here in Grand County, Colorado USA. 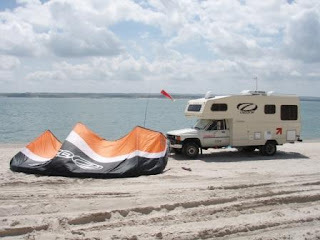 Our leases are ending and we are moving things in storage, fixing our rig and going into the world of kiteboarding. Check us out as we embark on this adventure! Check out the google maps on this! You can see your house!!! If you like what I am Blogging then Buy Me A BEER!! Become a Fan Of OZONE on Facebook!! This is the MOB's Blog!! Where the best of the best show you where to kite!! Oh and put any shots up of others!! And where you Ride!!! Tell Me what you Think?!! !